Barley is a village and civil parish in the district of North Hertfordshire, England. According to the 2001 census, it has a population of 659, increasing to 662 at the 2011 Census. The place-name refers to a lea or meadow and not to the grain-producing plant. Coincidentally to the southwest lies the village of Reed. The Prime Meridian passes to the west of Barley, which is located on the Royston to Saffron Walden road, as well as the medieval London to Cambridge road. Barley has a church with a 12th-century Norman tower, which is dedicated to St Margaret of Antioch. The church fell into a poor state of repair and was rebuilt in 1872 using designs by William Butterfield. Only the tower and three bays of the south arcade were retained from the original building. A well-known landmark in the village is the sign of the "Fox and Hounds" public house. On top of a beam are painted silhouette figures of huntsmen and hounds chasing a fox into the gable of the public houses at the top of Church End. Although it is a long-established feature of the village, the sign has not always been at its present site. In 1955 the Fox and Hounds, with its famous sign, was a pub located in the High Street, at the time part of an important route to London. In 1955 the Fox & Hounds burned down in a disastrous fire. The sign, which was partially saved, moved to its present site and the existing pub (the Wagon and Horses) was renamed. The pub and its sign are Grade II listed. There are now two pubs in the village - the other being the Chequers. The village also includes a 17th-century lock-up and an early Tudor town house with a large timbered upper room, which was mentioned by Daniel Defoe in a travel book in 1726. A local eccentricity is to embed objects into the flint walls. The Manor has a row of dentures set into its flint wall at one point and a cherub at another, while one of the newer houses in the village has a small figure of the Buddha set into its wall. The area has been home to residents for perhaps 3000 years; evidence has been found of Bronze Age settlers in the hills around Royston and Iron Age farmers to the north of the village in 100 BC, and Romans again occupied the parish. Listed in the Domesday Book as Berlei, the name Barley derived not from the local crop but from Beora's Ley, the woodland clearing of a Saxon Lord. Barley is home to a junior school, playground, village green, tennis courts, cricket team, stables, football team, petrol station and a post office and store. There are regular bus services to Royston and Hertford. Although there is a steady flux of people moving into and out of the village, and a substantial commuter element (Royston station is only 10 minutes drive away - and then only 35 minutes to Kings Cross) - there are still a substantial number of long-established families resident in the village. Notable historical residents include William Warham, Rev Charles Oswald Miles, Curate from 1882-5 and Thomas Willett, future Mayor of New York. His house Willet's Cottage was demolished in 1972. Sam Smith worked in the local shop before the height of his fame. The actress Jaye Griffiths also lives in the village. ^ a b c d "Village". Barley. ^ "Church of St Margaret of Antioch". 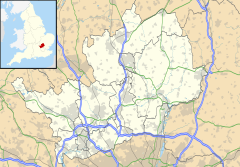 ^ Comprehensive Gazetteer of England and Wales. 1895. Wikimedia Commons has media related to Barley, Hertfordshire.